Admit it. 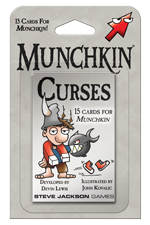 You love that moment when your enemy kicks down the door, and the card they draw is – a Curse (almost as much as you love playing Curses on your enemies yourself)! Whether it means losing items, skipping turns, or stumbling across a duck imbued with pure doom, a Curse always brings an element of gleeful mayhem.